From time to time, we look back into the AMM Archive to see what we find. This post was authored by Megan Stout Sibbel, historian, professor and co-chair of the 2017 Conference in Des Moines. Among museum professionals today, conversations frequently turn towards issues of engagement and inclusion. Strategies to reach new audiences and expand community access appear in articles, academic journals, and conference sessions. As it turns out, these same questions were actively discussed among museum folks almost seventy-five years ago, and some of the answers were…interesting. 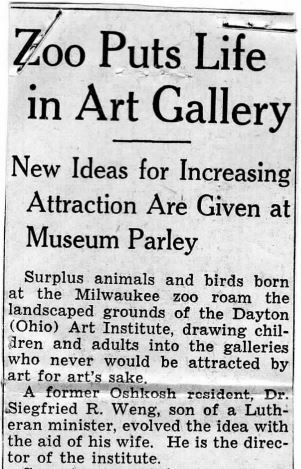 Attendees at the November 1944 Michigan-Indiana-Ohio Museums Association (the forerunner to our present Association of Midwest Museums) conference in Milwaukee were presented with a novel approach to increasing art gallery visitorship: add animals! The director of the Dayton Art Institute in Ohio, Dr. Siegfried R. Weng, offered his museum as a case study for the benefits of museum-as-menagerie. To the surprise of no one, Dr. Weng noted that “some trustees of the art institute…don’t like the ‘circus’ idea.” Still, he and his staff forged ahead. 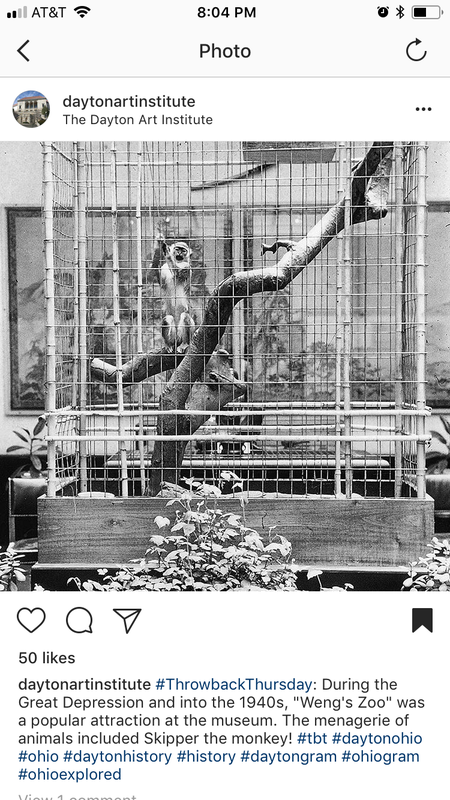 Encouraged by the unexpected surge in attendance that accompanied the addition of a white squirrel to a birdcage of finches in the Institute’s children’s room (an action spearheaded by Miss Margaret Davis Clark, director of education), Dr. Weng contacted the Milwaukee Zoo. The Zoo responded enthusiastically in a commendable display of community partnership. And there you have it! Another stratagem for increasing engagement. When audience outreach and inclusion comes up at your next staff meeting (and you know it will), feel free to reference the innovative programmatic efforts of Dr. Weng and the Dayton Art Institute in 1944.